Is taking a food supplement cheating? Our customers are law abiding citizens. We do everything in our power to ensure we never attract deceitful or nasty customers. Because... ...well, life's too short. And I don't have time for those types of folks. So when someone asks us if drinking Lean Greens or taking ANY of our food supplements is just 'cheating', you can imagine my reaction. In some ways I can see where they are coming from. But, for now, here's five tips for deciding if a food supplement is right for you. 1. Only use food supplements where your regular diet misses out. Natural magnesium stores are depleted in many people, causing poor sleep habits, hormonal imbalances, and increased anxiety. 4. Only upgrade your nutrition, with habits you can maintain long term. Don't supplement or change your diet if you can't stick with it beyond the first few weeks. Short term fixes are never long term solutions. No point eating healthy foods if your gut can't digest them. Replenish gut bacteria and take in digestive enzymes first. Why is the perfect diet is unobtainable? Ideally we'd all have the perfect nutritional habits, eat lots of fresh vegetables and live with vibrancy, energy and all that utopian stuff. But for most of our customers, being "perfect" is FAR from their thoughts. Getting anything vaguely healthy during our frantic day is the best we can hope for. The only folk who think drinking greens is "cheating", are those with too much time on their hands, don't have a family or career and no real perception of what real life is like. The whole idea behind Lean Greens is to allow normal folk like you and I to make strategic upgrades to our nutrition which make the biggest differences without it impacting our busy lives. At Lean Greens, we say "Upgrade Your Nutrition". Each product in our line is designed as an Upgrade not a replacement. Lean Greens makes up where your diet misses out. Lean Greens signature product, the super greens drink, comes in a 33 day supply available from their website. Simply mixing a scoop with ice cold water, your smoothie or juice first thing in the morning will top up your vegetable intake where your normal diet misses out. 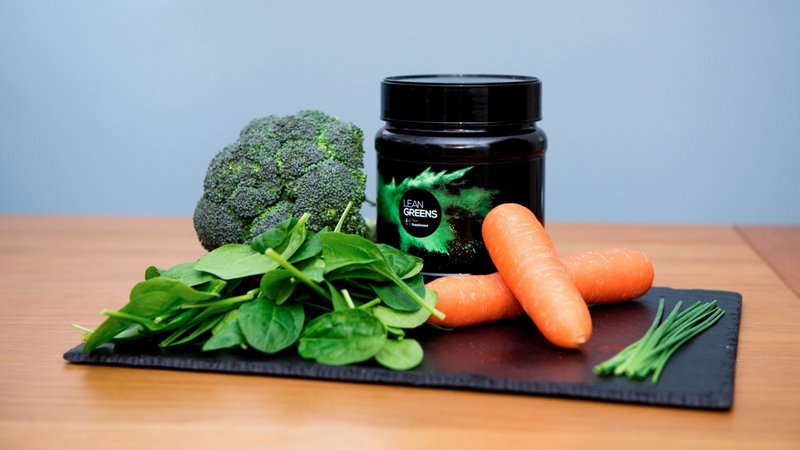 Containing a blend of 3 vegetables, 5 grasses and water based greens, digestive enzymes and metabolism boosting ingredients, Lean Greens is the daily upgrade to a diet that needs a boost. Our founder, Tim Goodwin, is the architect behind the Lean Greens range of nutritional upgrades. As a health coach to 1000's of clients, all of whom had time-pressures, family and career limitations, Tim understood clearly the impracticality of getting in a "perfect" diet. "There is little point having the best nutrition plan in the world, if you can't stick to it long enough to see results"
The theory of counting calories, ideal macro ratios, meal preparation and timing and shopping for fresh ingredients every day WILL create the body change many are looking for. But in the real world of your crazy busy life as a parent and holding down a career, such 'perfection is nigh on impossible. What we discovered after seeing 100's of food diaries from people just like you. After reviewing literally 100's of food diaries during his time as a Personal Trainer, the one thing that stood out was the distinct lack of vegetable intake. "This creates a problem many people trying to lose weight are all too aware of. Cravings and appetite control." The nutrients from your vegetable intake provide your body with a wide range of vitamins and minerals, keeping your brain's hunger and cravings signals under control. The solution Tim discovered late in his career would save his clients a whole lot of anguish, and accelerate their results. Greens drinks are not a new invention. However, a greens that pack in the right amount of raw vegetable and greens ingredients in a drink that is actually palatable is something unique to Lean Greens. "Today, Lean Greens is one of the UK's most popular and widely acclaimed greens drinks on the market. With 1000's of customers enjoying then benefits of a healthier lifestyle." * Lean Green's was recommended in Good Housekeeping sometime ago and I bought it based on that review. I take it everyday and find it keeps me on the straight and narrow with regards to my eating. I'm just an ordinary over 50's woman trying to keep healthy- I walk but no time for anything else fitness wise. Lean Green's gives me a boost each morning and if I'm feeling a bit low I take another scoop before bed. Try our line of food supplements by Lean Greens. Upgrade Your Nutrition today.